Tagaytay City, PHILIPPINES— Conference on Chapter Ordinations and Manual of Directions was concluded last October 31, 2018 at Tahanang Talangpaz, Tagaytay City. The discussion was centered on the implementation of the Chapter Ordinations as Life and Mission Project (LAMP) and the new Manual of Directions of the Congregation as the fruit of the prayerful discernment of the capitulars last April 16-May 6, 2018 at Tagaste Retreat House, Tagaytay City. There were four batches of sisters who attended the conferences. The first batch was on July 16-21, 2018. It was composed of superiors of all 39 houses and houses in the foreign missions and some treasurers and school principals. The second batch was a good mix of school administrators and community members and those engaged in other apostolates other than schools. It was scheduled on August 29-September 2, 2018. Both batches were held in Tagaste Retreat House in Tagaytay City. The third batch was held in the Mother house, at St. Rita College-Manila Audio-Visual Room on September 15-19, 2018. 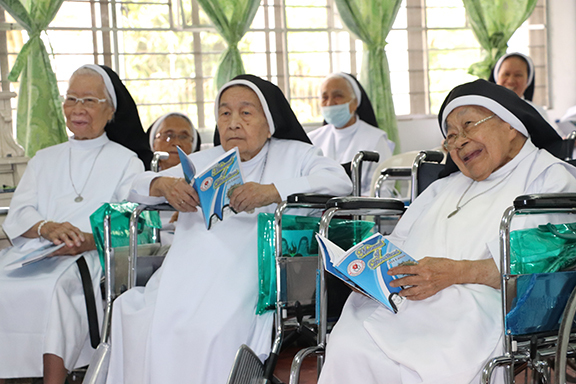 The third batch was intended for the elderly sisters who are residents of the Mother house but were joined by some temporarily-professed sisters from the Juniorate House and still some sisters who did not make it to the previous conferences. The last batch was a special one—in Tahanang Talangpaz for our sick and elderly sisters and for their sister caregivers. It was held on October 29-31, 2018.